We are thrilled to announce that Camp Owner and Director Audrey “Sunshine” Monke’s debut book has a scheduled release date. The book is ready to go and we’re excited to read it! 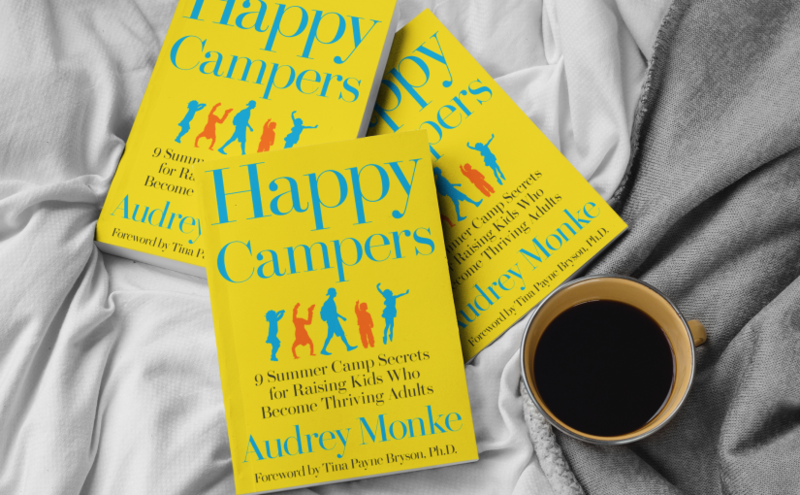 Happy Campers: 9 Summer Camp Secrets for Raising Kids Who Become Thriving Adults will be released on May 7th, 2019. Based on thousands of interactions with campers, camp counselors, and parents, and on academic research in positive psychology, Happy Campers introduces a framework of intentional strategies to help parents create the same kind of transformational culture that kids experience at camp. Instead of raising a generation of kids who are overwhelmed, anxious, depressed, and unable to function as independent and responsible adults, parents can create an environment at home that promotes the growth of important character traits and social skills that kids need in order to have meaningful and successful lives. Complete with specific ideas to implement these summer camp secrets at home, Happy Campers is a one-of-a-kind resource for parents wanting to raise happy, socially intelligent, successful kids. If you’re in the Los Angeles area and would like to attend a meet and greet with the author, Sunshine will have copies available (and will happily sign them) at our GAC Party on May 5th. To help you pass the time until the book is released (and to make you smile), enjoy this video of Sunshine unwrapping her first book for the first time!